Transmission electron micrograph shows a strain of the arsenic-eating bacterium called GFAJ-1. One of the basic assumptions about life on Earth may be due for a revision. Scientists have discovered a type of bacteria that thrives on poisonous arsenic, potentially opening up a new pathway for life on Earth and other planets. If you thumb through an introductory biology textbook, you’ll notice that six elements dominate the chemistry of life. Carbon, hydrogen, oxygen and nitrogen are the most common. After that comes phosphorus, then sulfur. Most biologists will tell you that these six elements are essential; life as we know it cannot exist without them. The organism in question is a bacterium, GFAJ-1, cultured by Wolfe-Simon from sediments she and her colleagues collected along the shore of Mono Lake, Calif. Mono Lake is hypersaline and highly alkaline. It also has one of the highest natural concentrations of arsenic in the world. On the tree of life, according to the results of 16S rRNA sequencing, the rod-shaped GFAJ-1 nestles in among other salt-loving bacteria in the genus Halomonas. Many of these bacteria are known to be able to tolerate high levels of arsenic. But Wolfe-Simon found that GFAJ-1 can go a step further. When starved of phosphorus, it can instead incorporate arsenic into its DNA, and continue growing as though nothing remarkable had happened. “So far we’ve showed that it can do it in DNA, but it looks like it can do it in a whole lot of other biomolecules” as well, says Wolfe-Simon, a NASA research fellow in residence at the USGS in Menlo Park, California. “It is the first time in the history of biology that there’s been anything found that can use one of the different elements in the basic structure,” says Paul Davies, the director of BEYOND: Center for Fundamental Concepts in Science at Arizona State University in Tempe, Arizona. Michael New, NASA’s astrobiology discipline scientist, agrees. “The discovery of an organism that can use arsenic to build its cellular components may indicate that life can form in the absence of large amounts of available phosphorous, thus increasing the probability of finding life elsewhere,” he said. “This finding expands our understanding of the conditions under which life can thrive, and possibly originate, thereby increasing our understanding of the distribution of life on Earth and the potential habitats for life elsewhere in the solar system." The DNA molecule is shaped like a spiral ladder. The “rungs” of the ladder are comprised of pairs of nucleotides, which spell out the genetic instructions of life. The sides of the DNA ladder, referred to as its backbone, are long chains of alternating sugar and phosphate molecules. A phosphate molecule contains five atoms: one of phosphorus, four of oxygen. No phosphorus, no phosphate. No phosphate, no backbone. No backbone, no DNA. No DNA, no life. GFAJ-1 apparently didn’t read the manual. When Wolfe-Simon starved GFAJ-1 cells of phosphorus, while flooding them with arsenic, far more than enough arsenic to kill most other organisms, it grew and divided as though it had been offered its favorite snack. The bacteria continue to swim around in their test tubes, unconcerned, despite the fact that, since Wolfe-Simon first collected them more than a year ago, the only phosphorus they have had access to was whatever was present in the original colony of cells, plus tiny traces, far too little to sustain ongoing growth and cell division, present as impurities in the cells’ growth medium. And you thought arsenic was poison, right? To most living organisms, it is. Arsenic is chemically similar to phosphorus, so it can sneak its way into living cells, as if wearing a disguise. But it is more reactive than phosphorus, in ways that tend to rip apart life’s essential molecules. DNA, for example. Somehow, GFAJ-1 appears to have found a way to overcome this problem. As a control, a second culture of GFAJ-1 cells was fed phosphorus instead of arsenic. They, too, grew and divided. GFAJ-1 seems able to switch back and forth, depending on how much phosphorus is available. “I have no idea how they’re doing what they’re doing,” Wolfe-Simon says. Once she realized that GFAJ-1 was capable of growing when starved of phosphorus, Wolfe-Simon set about finding out in more detail what was going on inside its cells. Could it be, perhaps, that she had found a microbe that, rather than incorporating arsenic into its biological structures, was instead exceptionally good at recycling extremely limited amounts of phosphorus? The backbone of standard DNA (the blue spiral ribbon-like structure in this drawing) contains an alternating chain of linked phosphate and sugar molecules. Strong evidence indicates that in GFAJ-1 the phosphate is replaced by arsenate. Wolfe-Simon and her colleagues used several different experimental techniques to find an answer. Data produced by mass-spectrometry methods known as ICP-MS and NanoSIMS, showing the distribution of various chemical elements within GFAJ-1 cells, revealed a clear difference between cells grown with arsenic and those grown with phosphorus. Those grown with arsenic were loaded with the stuff, but contained very little phosphorus. 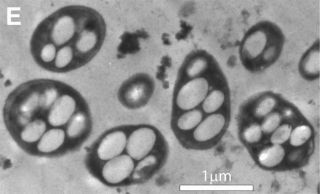 In cells grown with phosphorus, the opposite was true. By introducing radioactive arsenic into the growth medium of some of the microbes, Wolfe-Simon learned that about one-tenth of the arsenic absorbed by the bacteria ended up in their nucleic acids. To confirm that this arsenic was being incorporated into DNA, she used a well-accepted molecular biology technique known as gel purified DNA extraction to isolate and concentrate DNA from GFAJ-1 cells. The value of this technique is that it ensures that no other material from the cell comes along for the ride. NanoSIMS measurement of these concentrated DNA extractions showed that arsenic was indeed present in their DNA. Still further evidence came from the use of a technique known as micro extended X-ray absorption fine structure spectroscopy (µEXAFS). µEXAFS can provide information about the structure of molecules by probing how its internal chemical bonds respond when stimulated by a beam of light. Within the DNA extracted from GFAJ-1 cells starved of phosphorus, it showed arsenic bonded to oxygen and carbon in the same way phosphorus bonds to oxygen and carbon in normal DNA. In other words, every experiment Wolfe-Simon performed pointed to the same conclusion: GFAJ-1 can substitute arsenic for phosphorus in its DNA. “I really have no idea what another explanation would be,” Wolfe-Simon said. Geomicrobiologist Felisa Wolfe-Simon, collecting lake-bottom sediments in the shallow waters off Mono Lake’s 10 Mile Beach. The research led to the discovery of an organism on Earth that thrives on arsenic. But Steven Benner, a distinguished fellow at the Foundation for Applied Molecular Evolution in Gainesville, Fla., remains skeptical. So “if there is an arsenate equivalent of DNA in that bug, it has to be seriously stabilized” by some as-yet-unknown mechanism, Benner said. Benner suggests that perhaps the trace contaminants in the growth medium Wolf-Simon uses in her lab cultures are sufficient to supply the phosphorus needed for the cells’ DNA. He thinks it’s more likely that arsenic is being used elsewhere in the cells, in lipids for example. “Arsenate in lipids would be stable,” said Benner, and would “not fall apart in water.” What appears in Wolfe-Simon's gel-purified extraction to be arsenate DNA, he added, may actually be DNA containing a standard phosphate-based backbone, but with arsenate associated with it in some unidentified way. The discovery of GFAJ-1’s unusual abilities suggests a number of avenues for further research. One obvious one is to see whether any other organisms can perform similar biochemical tricks. Wolfe-Simon “would be very unlikely to have just found the only arsenic life-form on Earth on the first try. So it’s got to be the tip of a very large iceberg,” Davies said. Meanwhile, Wolfe-Simon has ordered stock cultures of several previously identified Halomonas organisms, close relatives of GFAJ-1 on the genetic tree, all known to be arsenic-tolerant. She plans to test whether they, too, can survive in a phosphorus-free environment. These and other investigations will help to clarify how extensive a role arsenic plays both within GFAJ-1 and in terrestrial biology as a whole. Wolfe-Simon’s research is funded by the NASA Exobiology/Evolutionary Biology program. This story is presented in cooperation with Astrobiology Magazine, a web-based publication sponsored by the NASA astrobiology program.